"I work with a Warm Up America group in Lexington, KY. One of our members brought in a block of circle cloth and a copy of your pdf pattern. We were totally fascinated. One member brought in a block she had done over the week and that inspired several of us to create our own blocks. The idea of connecting the various blocks into a small blankie grew out of our fascination. We did agree on Red Heart yarn and that the back color would be white. There probably will not be sufficient number of circle cloth blocks to make the entire blankie so we will do simple spacer blocks. Now we have to figure out how to connect these blocks! I’ve thought of stitching or crochet to connect the blocks but wondered if you had any suggestions for me. I would appreciate any suggestions or advice. Thanks for sharing such a creative pattern with us all." First, I'd like to share with you my thoughts on the subject, but remember I've never tried to make a blanket out of circle cloths. The first method that always comes to mind is the good old mattress stitch, but as most of you who read my blog regularly know that I avoid sewing knitted items at all costs...therefore I can't really recommend this method. The mattress stitch would be very forgiving and adjustable given the fact that the circle cloths, as the original pattern has been written, have very untidy edges. If you don't mind sewing. This would be a good approach. 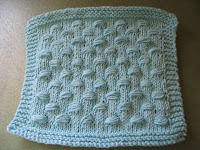 With that comes my next thought...when I recently knit my circle baby blanket I played with the idea of a neater edge for the cloths and subsequent baby blanket. It worked out great for the blanket and I rather liked how the edge turned out on my experimental cloths. I think if I were going to make a bunch of cloths into a blanket I would plan on using this edge on my cloths. It would make the assembly a little easier. 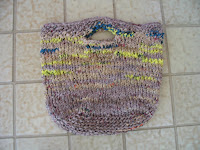 I used orange yarn so you could see how it worked out. Looks pretty good to me and pretty easy to do with the neater edged circle cloth. 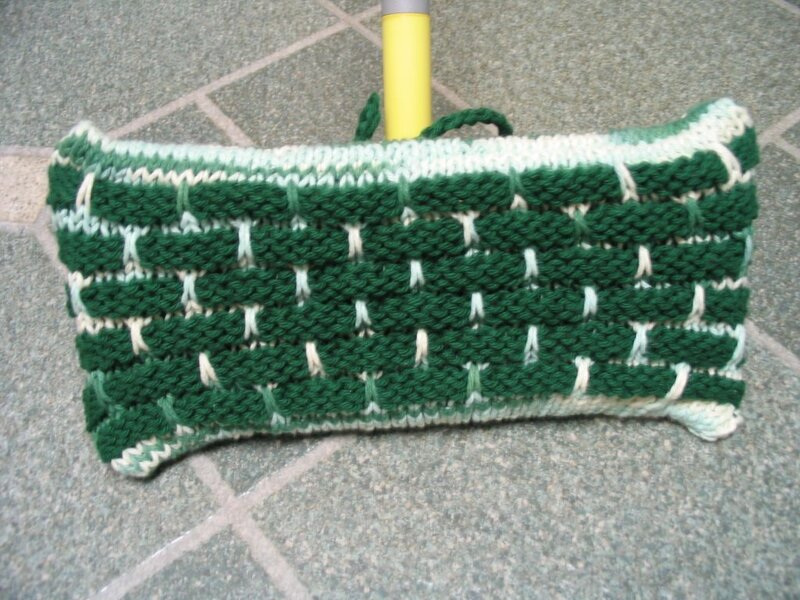 If you didn't mind adding more work to the assembly edging the cloths first with single crochets might even be better. 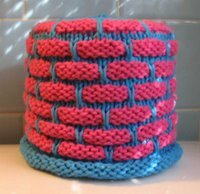 I imagine the original (untidy edge) circle cloth with the slip stitch might work as well, but edging the squares first with single crochets might be a necessity. Then there is the braided flat crochet option. I have successfully used this method to assemble a tessellated fish blanket and two (Pine Street Inn Knit-a-thon) blankets of all sorts of different types of squares, both knitted and crocheted and was happy with the results. This method is also pretty forgiving and I don't think a border of single crochets would be necessary. Well, hope this helps. There are lots of options and I bet there are lots more out there. Anita, sure hope you'll send me photos of your group's completed circle cloth blanket. I would love to show it off here on my blog! I am very happy and flattered that you are so excited about my circle cloth pattern and you are using it to help others. Good luck with your assembly and be sure and let me know how you make out. I'm confused, I see squares; not circles being joined. Squares, rectangles can be joined lots of ways, my favorite is the one you like least....stitching them together. I like that when I've edge them because it looks neat, put together I think. Crocheting them together, join as you go is faster; only works well if the squares are the same size. Hum, mattress stitch. I find that tedious. Ok for a seam in a sweater or something along that line; but a whole blanket...yikes. I would not opt for that. Anxious to see what others think, and what you end up doing. Great informative post - lots of food for thought and experimentation. If time permitted, it would be great to try several of these out to find out which worked best for the person sewing them together. I think a blanket made up of those squares would be simply gorgeous! I can see it now, you can do so much with that. You are a great seamer, my hats off to you! I agree the pattern is great so I'm also not surprised to see it catching so much attention. I'm pretty bad at seaming, well not bad but I find that it's my least favorite thing to do so I generally try to make blankets all in one piece. The problem with that though is that at a certain point it's a beast to work on because of it's size. I'm just finishing up a large throw for my sister and I'm so excited to be done with it. I just started a circle baby blanket...after having a great time making the cloths. I REALLY like your method for neatening up the edges. I've never used that technique before and, actually was doubting that it would work. But, it does. Thanks! I made that one ball band afghan and hated sewing the strips together. I'd like to try making one on really long circ's. Thanks for sharing a new method. Anything but sewing is worth a shot. Have a great weekend!!! Those are some good options. I've never made anything like that, so I wouldn't have thought of the dilemma of sewing the circles together. Now I have something to keep in mind for when I do try to make something with that stitch pattern.